To do: Point down exactly how long the berries take to regrow and such, for both games. And mention how they start as sprouts and grow with time. The Burgeoning Spiderwort (ピキノツユクサ?, lit. : "Asiatic dayflower of the Pikmin") is a plant in Pikmin 2 and Pikmin 3 that produces the berries with the nectar that is needed to make ultra-spicy- and ultra-bitter sprays. They are found in the Awakening Wood, Perplexing Pool, and Wistful Wild in Pikmin 2, and the Tropical Wilds, Garden of Hope, Distant Tundra, and Twilight River areas in Pikmin 3. In Pikmin 2, Ravenous Whiskerpillars can appear in their vicinity, as well as some type of mold that shows up and keeps the plants from growing. This can be destroyed sufficiently quickly with a medium-large group of Pikmin. Each plant can have up to five berries at once. Some only contain red berries, some only purple berries, and some contain a mix of the two. 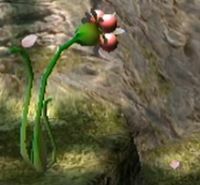 In Pikmin 3, since the ultra-bitter spray does not return, only the red-berry Burgeoning Spiderworts exist. The berries are small, tiny fruits that come in red or purple based on the nectar. They grow on top of the Burgeoning Spiderwort, and can be knocked down after the plant has been attacked enough. Once on the ground, a Pikmin can pick it up, and deliver it to the Hocotate ship, S.S. Drake, or SPERO. 10 berries of a given type are necessary in order to concoct one additional spray. New berries will show up after some time, which depends on the game. After a berry has been dropped, it can vanish, but the rules for this also depend on the game. Both of these points are elaborated below. If there are Ravenous Whiskerpillars nearby, they will climb up the plant and begin eating the berries, one by one. In both games, Pikmin that are ordered to harvest a Burgeoning Spiderwort will go up to the base of the stem, climb up, and once they reach the berries, they will begin pummeling. Periodically, as damage is caused, a berry drops down. When all of the berries are gone, the Pikmin still attached to the plant all drop down at once. Pikmin that fall off from the top of the plant will fall in a random direction, and if they land near the base of the stem, they will climb back up and repeat the process. Otherwise, they will become idle or follow the leader, if he is nearby. This means that leaving Pikmin behind to work on the next batch of berries is not very effective, since the Pikmin will not climb up the plant automatically, and the ones that do will likely end up falling out of the stem's reach eventually. In addition, because Pikmin will not drop down of the plant until all the berries are gone, the player runs the risk of a berry falling down, no Pikmin coming down to get it for a while, and the berry disappearing. In this game, berries can only remain on the ground for 40 seconds, after which they burst and disappear. Having a Pikmin carry them does not reset this time, but it does freeze it. It is worth noting that the timer that ticks down how long until the next berry shows up will keep ticking if the player is in a treasure collection cutscene. The berries take about one minute to regrow. [source needed] If a bomb rock explodes near a Spiderwort, or a Rock Pikmin is thrown directly at the center of the berries, then all of the plant's berries will drop at once. In this game, when the Pikmin are pummeling away at cluster, a Pikmin will drop whenever a berry does, in order to pick it up right away. This makes the berry harvesting faster than in Pikmin 2, where the player has to wait for all the Pikmin to drop off at the end of the attack, or issue some Pikmin to the berry manually. When the Pikmin fall off, they will idle next to the plant, but will not climb back up unless there are new berries to be harvested. This allows the player to keep a few Pikmin busy with the plant throughout the day and be assured that they will continuously harvest it. On top of that, unlike Pikmin 2, a Pikmin that delivers a berry will return to the Burgeoning Spiderwort on its own. If a Pikmin carrying a berry is whistled, it will drop the berry, which will instantly disappear. Two Burgeoning Spiderworts with ultra-spicy berries, near the landing site. The Burgeoning Spiderwort that appears starting on day 11. The Spiderwort near the Bulblax Kingdom. The Awakening Wood has more Spiderworts in the region than any other area in the game. There are two Spiderworts a short walk away from the landing site, which both produce red berries. In this area, two Ravenous Whiskerpillars appear. Mold may also appear here. Due to the fact that there are two of them, and that they are so close to the landing site, this is possibly the best berry-harvesting place in Pikmin 2. A player can gain about three or four sprays a day if they dedicate the day to berry harvesting. There is one next to the area where the Iridescent Flint Beetle is, near the Pilgrim Bulb but it does not appear until day 11. It is on a ledge and only produces red berries. There is a final one near the entrance to the Bulblax Kingdom. To make reaching it easier, Blue Pikmin can be used to destroy the water gate behind the landing area. Then, by having them attack the clog there, the water will disappear. This Burgeoning Spiderwort only produces purple berries. The Burgeoning Spiderworts near the Gherkin Gate. The Burgeoning Spiderwort on the water. On the Perplexing Pool, there are two near the Gherkin Gate, both of which produce purple berries. A Fiery Blowhog and Swooping Snitchbug hang around here, as well as three Ravenous Whiskerpillars and the occasional mold. Beyond the entrance of the Citadel of Spiders, there is a plant stemming from the water, so only Blue Pikmin can attack it. Only red berries are produced from it. Near the path to the entrance of the Hole of Heroes in the Wistful Wild, there is a large field with the most number of Spiderworts known in one spot: three. All of them produce both kinds of berries, with each berry being decided at random. There are three Whiskerpillars here and a mold will cover each individual plant. A Fiery Blowhog and a Watery Blowhog keep watch over the area. The only Burgeoning Spiderwort of this area. There is a single Burgeoning Spiderwort plant located in the very center of the Tropical Wilds. It is behind the landing site and just beyond the small body of water that holds a Cupid's Grenade. Once the nearby reinforced wall is blown down and the nearby bridge built, Pikmin will be able to more easily take these berries to the ship. The first Burgeoning Spiderwort, next to the Waddlepus. The second Burgeoning Spiderwort, near the Toady Bloyster. There are two Burgeoning Spiderworts in the Garden of Hope. The first is fairly close to the S.S. Drake and Onion. Unfortunately, it is in a part of the Garden of Hope that can only be accessed after the player rescues Louie. It is across a brown bridge, which must be built by the Pikmin, being guarded by a Waddlepus. It is one of the best places to get Spiderwort berries from, because there are no enemies between it and the Drake, aside from the Waddlepus. The second one is located even closer to the base, but only appears when the Data Glutton has been retrieved, and will disappear once the player has obtained Blue Pikmin. It is located behind the landing site, near a pond with a Toady Bloyster, Skitter Leaves, and a pair of Yellow Wollywogs. Once these threats have been cleared, Pikmin can quickly gather berries en masse. The Burgeoning Spiderwort near the Dodge Whistle. The Burgeoning Spiderwort on top of the pot. There are two Burgeoning Spiderworts in the Distant Tundra. The first one is located near the exit to the Vehemoth Phosbat's cave and where the Dodge Whistle upgrade can be found. After clearing the area of the nearby Joustmite and Swooping Snitchbugs, Pikmin can harvest these safely. This plant will not appear on the player's first time visiting the area. The other Spiderwort is located on top of the pot where a pile of bridge fragments are initially located. As such, this plant will not appear until these fragments are cleared. If the player uses Winged Pikmin to harvest it, they can fly over the river, safely bypassing the Joustmites sleeping below. The Burgeoning Spiderwort after the electric gate. The Burgeoning Spiderwort on the second section of the area. There are two Burgeoning Spiderworts in the Twilight River. The first one is located just across the river behind the Drake and behind an electric gate. Once the nearby Yellow Wollywogs have been dealt with, Pikmin can harvest these safely. Oddly, Winged Pikmin take the lily pads back to the Drake, even though they can clearly fly over the river. The second one is located right at the entrance of the area's second section. There is a nearby Arachnode, although it should not be much trouble if the player uses any type other than Winged Pikmin to harvest the berries. It is also highly recommended the player has Pikmin move the nearby box so they can have a much easier route back and forth between the berries and the Onion. "Spiderwort" is the name used in the real world for flowers of the tradescantia genus, and "to burgeon" means "to grow quickly", referring to how their berries grow very fast. Its Japanese name is ピキノツユクサ?, which means "Asiatic dayflower of the Pikmin". 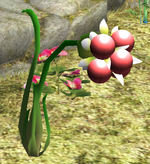 The plant's internal name in Pikmin 3 is tsuyukusa, which is a Romanization of 露草?, or "Asiatic dayflower". A Ravenous Whiskerpillar devouring the berries of one of the plants. A Burgeoning Spiderwort being harvested by multiple Blue Pikmin in Pikmin 2. A harvested Burgeoning Spiderwort in Pikmin 2. A Burgeoning Spiderwort, as it appears in Pikmin 3, can be seen in the bottom right corner of the image. A Burgeoning Spiderwort in Pikmin 3. A shot of the Burgeoning Spiderwort's berries in Pikmin 3. The purple berry variant of the plant. The mixed berry variant, on the Wistful Wild. A berry being beamed by the S.S. Drake. Two berries lying on the floor. An early version of Pikmin 2 with some Burgeoning Spiderworts. Pikmin carrying berries in an earlier version of the game. ↑ YouTube video showing how the berry timer keeps going in a treasure salvage cutscene. This page was last edited on March 11, 2019, at 15:53.